Beneficiaries of a business initiative seen here with the first delivery of eight LPG tankers that were given to four Naga beneficiaries, on Saturday in Guwahati. 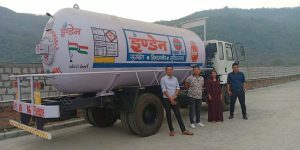 Dimapur, April 14 (EMN): The Dalit Indian Chamber of Commerce and Industry (Dicci) has provided eight Liquefied Petroleum Gas (LPG) tankers to four Naga entrepreneurs. The tankers were given by the association to the entrepreneurs to operate them for the Indian Oil Cooperation, updates on Sunday stated. The Dicci is an Indian association that promotes business enterprises for Scheduled Caste and Scheduled Tribe communities. The tankers were given to four beneficiaries, the first batch of 108 beneficiaries, at Guwahati in Assam on Sat. April 13 in the presence of Dicci’s Nagaland state coordinator K Kathi Chishi, who is also the managing director of Toka Multipurpose Cooperative Society in Dimapur. The Dicci inaugurated its office in Guwahati on October 2018 and officially instated its first chapter in Nagaland in the Northeast. It was also reported that the organisation has about 150 members in the Northeast state and has already been assisting beneficiaries from across the region as part of the Stand-up India Scheme. This is stated to be an initiative in partnership with the Indian Oil Cooperation, Bharat Petroleum cooperation Limited by means of providing LPG tankers to Schedule Tribe/Schedule Caste entrepreneurs. Standup India was launched by the central government in 2016 to support entrepreneurship among women and Scheduled Caste and Scheduled Tribe communities. The scheme offers bank loans to scheduled castes and scheduled tribes and women to set up new enterprises outside of the farm sector. According to Kathi Chishi Nagaland has 57 beneficiaries with an accepted sanction of INR 57 cr. Out of 57 beneficiaries, the first batch of four beneficiaries were provided with eight LPG tankers on April 13 which will operate from Guwahati benefitting the beneficiaries with revenue. 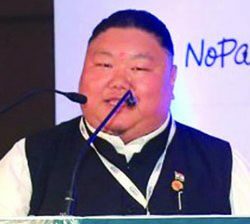 “The whole idea was about ‘look west’ as most of the youngsters are shifting to cities for better opportunities and the concept of Dicci was to provide opportunities to Naga entrepreneurs by generating revenues out of the state while they remain at home which will in turn benefit the community,” Chishi maintained. The Nagaland unit of the Dicci has signed a memorandum of understanding with the Bank of Baroda to help develop entrepreneurial skills among youths from the Scheduled Tribes, Chishi informed.